Authorities are in search of a runaway 17-year-old. 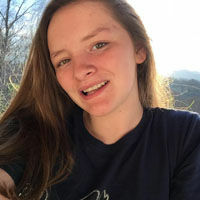 Makenzie Russell, address listed as Lackeytown Road in Old Fort, was last seen at her residence at approximately 8:30 p.m. on Sunday, April 7. She is described as a white female who stands 5 feet, 4 inches tall and has blonde hair and hazel eyes. Anyone with information concerning Russell’s whereabouts is asked to call the McDowell County Sheriff’s Office at 652-2235 or the McDowell County 911 communications center at 652-4000.